The submersible agitators are particularly suitable for the homogenization of liquid manure, sewage sludge and biogas substrates. Due to compact design and streamlined shape, the engines are notably energy-efficient. The usage of Burgmann face seals guarantees a long product life. High agitation capacity due to self-cleaning sickle-bladed propeller made from wear-resistant special steel (C 52-3). Anti-wrap guards on the propeller to prevent synthetic threads or the like from twining. 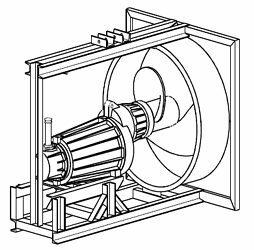 Extra-dimensioned motor (up to 15 kW). Geared motor, thereby developing high torque and having a decisive advantage when starting up in sinking or floating layers. Improved sealing due to gas filling inside the motor and the seal chamber with its cable inlets. Prevention of sinking and floating layers. Stirring in substrate during the "feeding" process, thus enhancing the evolution and the extraction of biogas. Low-noise operation due to helical gear drive. Long oil change intervals up to 3 years when using fully synthetic oil. Complete homogenization of the liquid manure after storage season. Rapid agitation of sinking and floating layers concerning pig, cattle and poultry slurry. Homogeneous manure is the basis for exact manure dispersion and an optimum fertilization effect. Because the agitator is mounted horizontally it is not necessary to put up expensive mixer ducts. This, in turn, helps reducing building costs (e.g. regarding slalom systems). 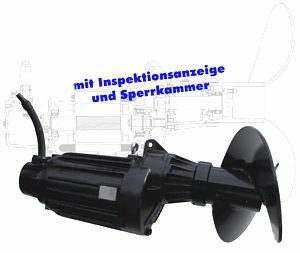 The compact design, the flow-optimized propeller and the 4-pole motor with a proficient power factor (cos phi) guarantee optimum efficiency. Height adjustment and lateral pivoting allow the fine tuning for an effective mixing performance. The advantages are a strong agitation effect with low energy costs. AT-MIX agitators are equipped with a seal monitoring device (gear oil conductivity) and with temperature sensors built into the motor’s winding. The evaluation unit for seal monitoring is included with delivery. Simple and quick installation, also in case of tanks which are already filled. Maintenance or replacement is possible even with a filled tank (after slightly lowering the fluid level). 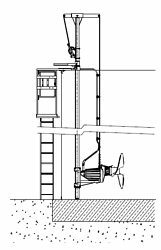 Mounting configurations: By usage of the illustrated installation variants the AT-MIX can be adjusted to the filling level of the silo in the most optimal way. The flow direction can also be determined in order to achieve the most effective agitation results. The square tube and the carrier cable are made of stainless steel (AISI). A transport trolley is available for use in underground tanks or manure channels. The AT-MIX is absolutely easy to service. When using fully synthetic oil the oil change intervals can be prolonged up to 3 years. 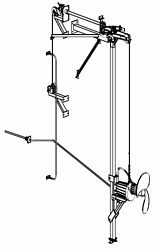 The AT-MIX was designe das a water pressure tight monobloc with an integrated gearbox. Corrosion resistant screws, a high level of tightness and a careful selection of the installed components (Burgmann face seals, propeller made of C 52-3, special cables) as well as the CNC-controlled manufacturing along with a thorough final check guarantee a long product life and a high degree of reliability. The AT-MIX was engineered for continuous operation and comes with industrial quality.